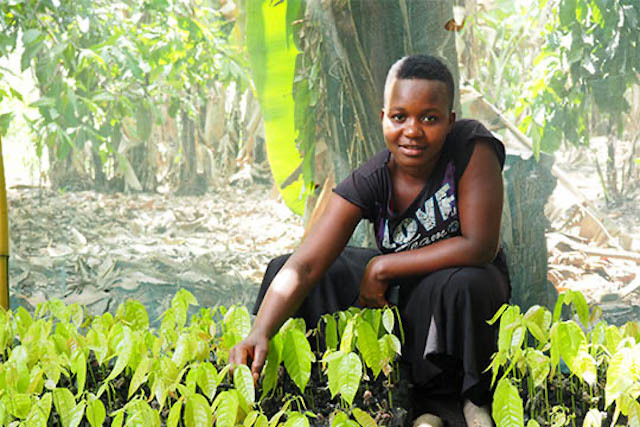 In Tanzania, where the cocoa market is dominated by men, TechnoServe is working to provide women the business skills, roles models, and confidence they need to start their own cocoa businesses and boost their communities’ cocoa economies. Delia (left) shows off her cocoa powder alongside her business mentor. She launched her cocoa business with the winnings from TechnoServe's businesss plan competition for women in the cocoa value chain. Up until this year, Delia had no part in her husband, Janky’s, cocoa business in Lema, Tanzania. 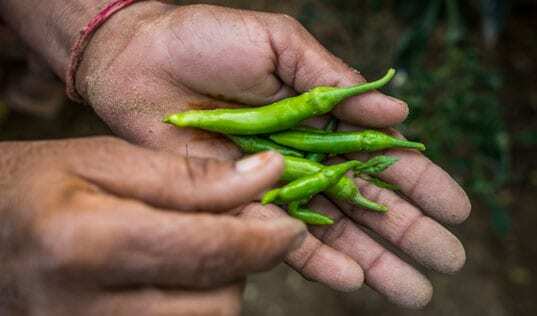 While he worked the farm and solely managed the income it generated, Delia took care of household responsibilities, and also ran a side business selling maandazi, a local snack similar to donuts. This is the case for many cocoa households across Tanzania. Men are more likely to own the trees, handle earned income, and conduct the most lucrative technical activities (such as pruning and seedling production) in Tanzania’s cocoa market system. From 2009 to 2016, Irish Aid and TechnoServe worked to harness the potential of Tanzania’s cocoa sector to create prosperous farming livelihoods through the Cocoa Quality and Market Access Program (CQMA). 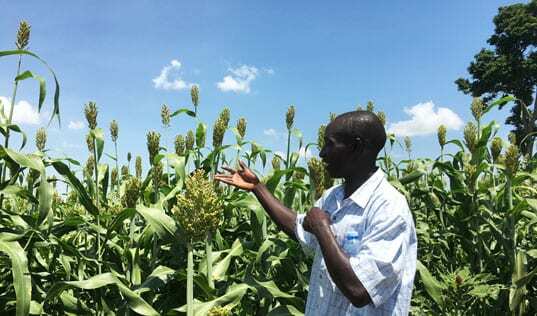 In that time, CQMA trained over 14,000 farmers in good agricultural practices, increasing their production by 26 percent. In order to learn from the program’s successes, the CQMA team dedicated 2017 to channeling the program’s results and learnings into a targeted initiative to bolster women’s income-generating opportunities throughout the value chain. Mariam Sanga, a winner of the business competition from Kisyoyo, Tanzania, shows off the seedling business she started with her winnings. Despite CQMA’s impressive results, the potential exists to generate much more substantial household and individual income gains by finding gaps in the cocoa value chain and by connecting women with the skills and opportunity to earn income and make decisions on its use. TechnoServe’s hypothesis was that strategically integrating women into this cash-crop value chain would not only benefit women financially and reduce certain tensions within the household, but would also amplify the market’s impact on the community level, as research demonstrates that financial benefits to women are more likely to be re-invested in their families’ health, nutrition, and education. Informed by a gender analysis that was conducted through CQMA in 2015, TechnoServe teams developed an approach to creating a more inclusive cocoa value chain in Tanzania, beginning with the launch of Household Effectiveness Training, which Delia joined in March 2017. At the training sessions – which were scheduled with flexible dates, times, and make-up classes to accommodate participating women’s many responsibilities and packed schedules – Delia soaked up information around business and household record-keeping, calculating profitability, business planning, and gender in the community and the household. These 12 training sessions provided Delia with the opportunity to learn and discuss these concepts not only with other women, but also with Janky. TechnoServe’s experience has demonstrated that jointly training both husband and wife increases adoption rates of learned practices as well as joint decision-making at home. Therefore, both partners were encouraged to attend household effectiveness trainings, and Janky often joined Delia or attended makeup sessions when they could not go together. Reflecting on the training, Janky says, “In training, we learned a lot about how to cooperate together. We are now planting, pruning, aggregating, and budgeting for school fees and food together.” In fact, 93 percent of participants who attended as a couple reported an increase in joint decision-making about income use, compared to 60 percent for couples in which only one person attended trainings. With a better understanding of key business skills and with Janky’s support, Delia decided to apply for the next phase of the program, the Business Idea Competition. Although TechnoServe has been conducting similar competitions across Africa and Latin American for over a decade, this competition was tailored specifically for pioneering women like Delia who sought to launch businesses in their cocoa communities. A panel of judges assessed proposals based on their demonstration of financial planning, marketing strategy, family support, and the business’s involvement in the cocoa value chain. Business plans were presented orally in order to include farmers without strong reading and writing skills. 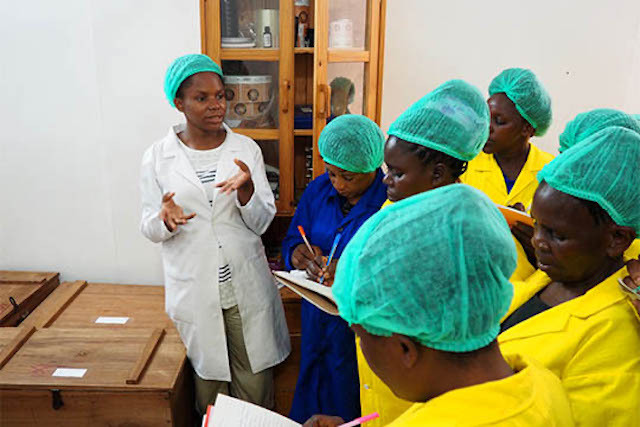 Through experiential learning visits, participating women were able to see how their products played a role in their country’s economy, reinforce their training, and learn about additional opportunities in the cocoa value chain. In order to help these emerging female business leaders to thrive, the program also connected 45 leading participants with mentors and role models. Mentors for the program were selected from successful local business people and held group sessions focused on topics such as business planning and entrepreneurship. In these meetings, participating entrepreneurs could learn from mentors and each other, ironing out the details that held their businesses back. This supportive business community allowed these new entrepreneurs to continue to learn, troubleshoot, and network, providing encouragement and support in their business journeys. Delia and her peers were also able to participate in experiential learning visits to successful business owners, traveling to learn from a female-owned bakery in Dodoma, female entrepreneurs in Mbeya, and a global processor of high-end cocoa products and extracts. Through these visits, they were able to see how their products played a role in their country’s economy, reinforce their training, and learn about additional opportunities in the cocoa value chain. Witnessing the business owners’ success was also encouraging, demonstrating how application of their business skills could lead to long-term success. 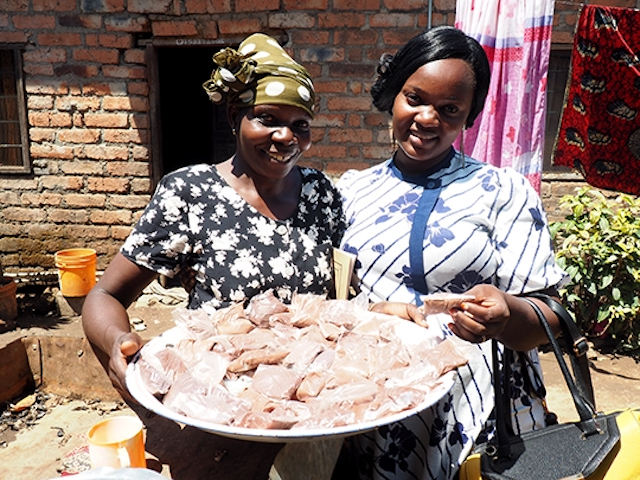 Throughout this year of learning around CQMA, 92 women pitched ideas for the business idea competition, 45 participated in mentoring sessions and experiential learning visits, and nine women like Delia received 1 million TZS to support their business ideas. With the business skills, well-articulated plans for value-add activities, role models, and family support that they needed to succeed, the barriers facing these women’s journeys as business leaders are diminishing, and a more inclusive and prosperous cocoa value chain for Tanzania is becoming achievable. 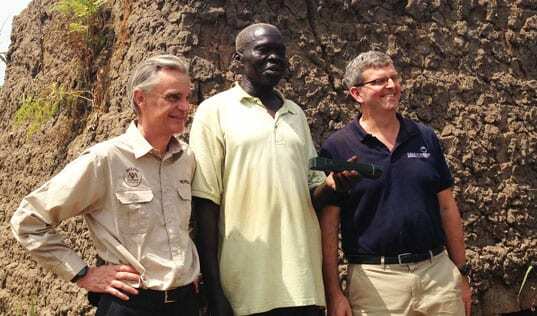 Read the story of Mama Crize, one of CQMA’s cocoa mentors, here.